Automatic pairing provides frustration-free connectivity: while magnetic charging allows for effortless docking when the headset is not in use. The Base Stations front display indicates battery life and charging status to ensure you never get stuck with a dead headset. The rear 3.5mm input/output supports additional audio sources: giving you the ability to take phone calls: overlay background music: or output your game audio and chat to external capturing devices. 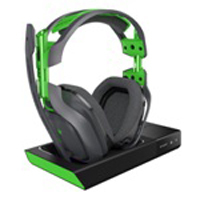 Customization of Audio and Voice Communications allows the gamer to fine tune the headset to his/her personal preferences and to the specific needs of any type of gaming environment.